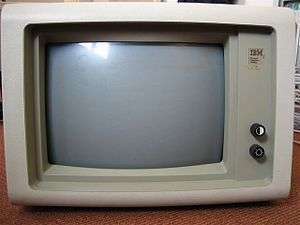 The IBM 5151 monochrome monitor. It only produced green colors because it used P39 phosphor. IBM designed its MDA monochrome display system to deliver extremely well-formed characters for the time. The monitor was meant to be hooked up to an IBM Monochrome Display Adapter which had no graphics modes at all, and only supported the 80 x 25 text mode, using 9 x 14 pixels per character. The Hercules Graphics Card had its resolution designed around this monitor, allowing cheap high-resolution PC graphics, and some people also used 5151 monitors with EGA boards for their mono modes. The monitor has an 11.5-inch wide CRT (measured diagonally) with 90 degrees deflection that is etched to reduce glare. The monitor uses TTL digital inputs through a 9-Pin D-shell connector. It is also plugged into the female AC port on the IBM PC power supply, and thus did not have a power switch of its own. Although the monitor was generally reliable, it was recognised that in the rare cases where failures did occur, the monitor's TFB648 high voltage transformer ('flyback transformer') was the most common cause. ↑ "The IBM XT LIVES!!". Forbes.com. Archived from the original on 2001-07-12. Retrieved 2008-11-16.